Mental health themed works in the visual arts and literature. The great American historian William Durant promoted a view of world events he called Integral or Total History. It was Durant's belief that studying history only through the eyes of political or social events created an understanding of history that was susceptible to the views of only those in power. Durant believed the real truth tellers were artists, playwrights, poets and musicians—they told the truth because they has no financial nor political power to lose. The truth of Durant's view of history can be seen clearly in the artistic interpretation of mental health through the centuries. Consider the many mental health references in Shakespeare's Hamlet and Macbeth. The Spanish artist Francisco Goya is perhaps the first artist to chronicle Posttraumatic Stress Disorder (PTSD) in his many paintings depicting emotional reactions to violence in his series The Disasters of War. The horror of civil war is epitomized in the Giant or Colossus that illustrates the collective depression of the Spanish people. Share your mental health themed art and poetry, we'll share it with others. In the slide how below you will find, Bosch's depictionof the barbaric Middle Age's practice of trepanation of cutting a hole in someone's head to remove their mental illness. The English artist Richard Dadd portrays the equally barbaric practice of jailing and isolating the mentally ill in Agony. 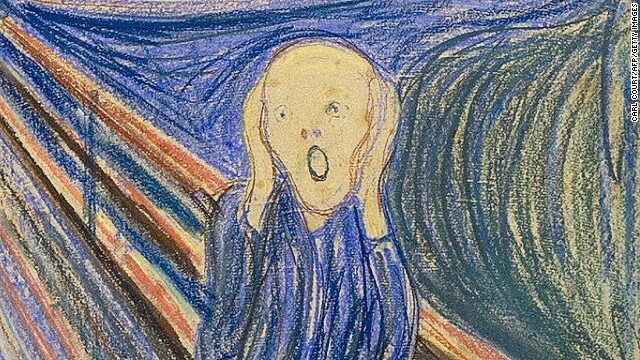 And perhaps the two most famous painting illuminating the psychological struggles with mental illness are Vincent Van Gogh's, Self Portrait with a bandaged Ear and Edvard Munch's The Scream. Finally, the tender but troubled Aya's Depression by modern artist, May Ann Lucudine powerfully portrays the struggles of youthful depression. Mental health themes are woven into much of the tapestry of the modern expression of literature from novels, plays, musical lyrics, poetry and the Spoken Word. stitche don and their heads pasted. We'd like to read and share your poems dealing with mental health issues. You can find out how to share them with us here.